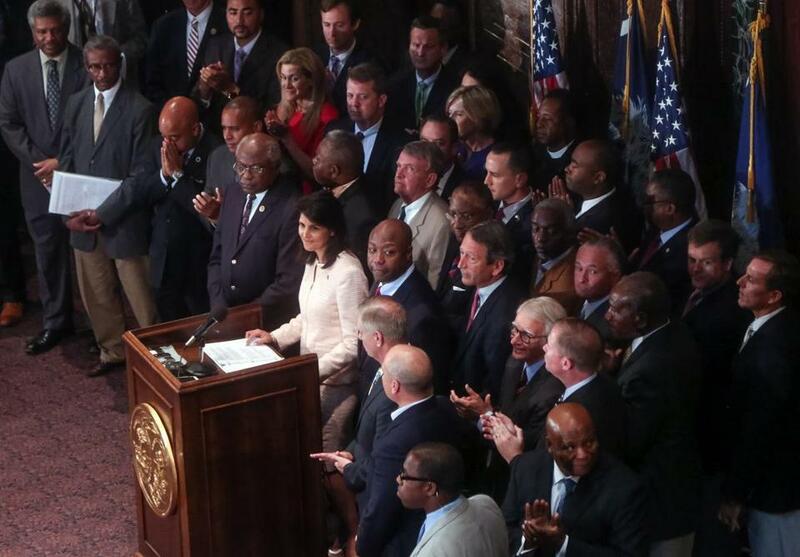 Governor Nikki Haley called for the removal of the Confederate battle flag on June 22. NEW YORK — The South Carolina Legislature is expected Monday to take up the fate of the Confederate battle flag that flies on the State House grounds, responding to demands that it be removed after the June 17 massacre of nine people at Emanuel AME Church in Charleston. The Senate, encouraged by Governor Nikki R. Haley and many other elected officials, is scheduled to consider a bipartisan proposal to move the battle flag, long viewed by African-Americans as a defiant tribute to South Carolina’s segregationist past, to the state’s Confederate Relic Room and Military Museum, also in Columbia. Still, observers expect an emotional debate, particularly in the House. And in the Senate — where the church’s slain pastor, the Rev. Clementa C. Pinckney, served — one member, Lee Bright, has announced plans to seek a statewide referendum. “This flag is a part of our heritage, so the people of this state should have the final say,” Bright, a Republican from Spartanburg County, told supporters Wednesday on Facebook. This weekend’s race was the first in the South since the racing series and its tracks urged fans to no longer display the banner. Bright, who sought the Republican nomination for a Senate seat last year, is also offering bumper stickers featuring the Confederate emblem and the message “Keep your hands off my flag” in exchange for campaign contributions. But he and others who support the flag are facing harsh political headwinds, with many of South Carolina’s elected and business leaders becoming increasingly vocal in their backing of the push to remove it. For instance, Haley, a Republican, was unequivocal last month when she called for the change after the killings, which the authorities have described as a hate crime. Still, some of the debate in the Legislature this week could focus on the speed with which it began. Many lawmakers had long believed the status of the battle flag was settled. The flag flew atop the State House for nearly four decades before state lawmakers, pressured by an NAACP-organized boycott and large protests, agreed in 2000 to remove it from the dome and place it at a memorial on the grounds. That agreement, codified in a law known as the Heritage Act, required that two-thirds of the Legislature agree on any subsequent changes to the flag’s status.